We know what you’re thinking: “Curtains in my man cave? You’ve gotta be kidding me!” Nope. But we are not talking about frilly, lacy, feminine curtains. We are talking heavy, manly panels that will add a touch of class without softening the look of the room. We are talking an old-school, smoking-jacket-and-brandy feel. In fact, we’re pretty sure that if Sinatra had had a man cave, it would have had some curtains in it; probably burgundy velvet ones. Curtains are an easy way to create a virtual wall, which you will need if you have an unfinished wall or a water heater you need to hide, or if you need to block off your man cave from the rest of the house. Our Eclipse Light and Sound Blocking Curtains are perfect for this use. These heavy panels block 98% of light and 100% of femininity. You can also use a curtain track with a heavy drape to separate, say, your poker table from your theater area. This is a sure-fire way to make you and your poker buddies feel like high rollers, and block out the noise from anyone who was more interested in watching the game than anteing up. Lastly, no self-respecting man cave is complete without a home theater area. We have gone on at length about how useful curtains can be in your home theater in a previous blog. Suffice it to say that they will set your home theater apart from other man caves – in a macho way. 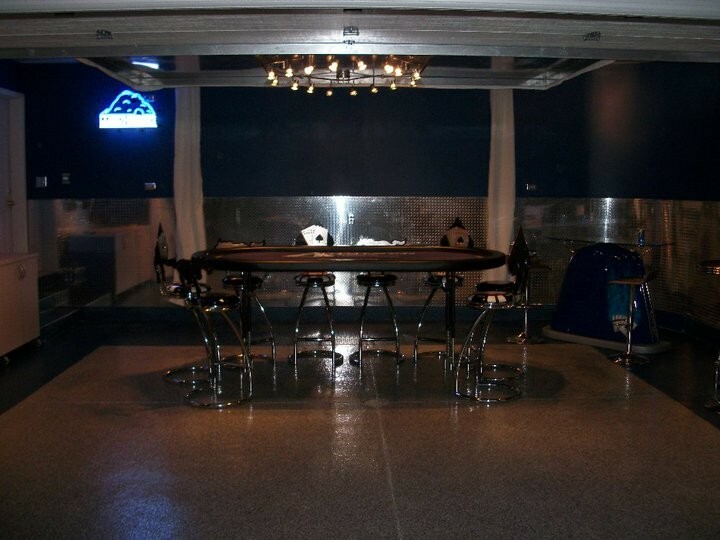 This Man Cave Poker Room Features Narrow Accent Curtains Suspended on Short Runs of 88001 Privacy Cubicle Track, Designed By The Man Card Crew. So let’s talk hardware. If you are going to be hanging heavy drapes (burgundy velvet ones perhaps?) you will need a heavy duty track such as our 3120 Extra Heavy Duty Curtain Track. This track is available in silver and black, is compatible with double wheel or short snap carriers, and has nothing feminine about it. If you need your track to curve, our 6100 Flexible Curtain Track is your best bet. It can be bent by hand without compromising strength for curved or angled applications. These tracks can be installed directly into the ceiling or wall with our drapery hardware, or onto a drop ceiling with the use of clamps. Do you want to show off your completed man-cave? We would love to see it! Send us your project photos and description to info@curtain-tracks.com and you just could win a $100 Curtain-Tracks credit!